Reflected in the tranquil waters of Loch Long, the Royal Navy's aircraft carrier ARK ROYAL was seen at Glenmallan on Thursday evening as darkness fell. 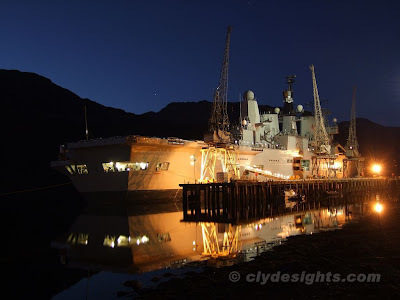 While at this berth, ARK ROYAL has been loading munitions from the nearby Glen Douglas munitions depot. She arrived here on Sunday morning.